Can CFD help to solve Australia’s greatest aviation mystery? Home » Business Benefits » Can CFD help to solve Australia’s greatest aviation mystery? On a stormy night in August 1981, a Cessna Centurion 210 aircraft crashed with 5 people on board in Barrington Tops, a rugged and isolated national park north of Newcastle, New South Wales. Despite a massive initial search effort and ongoing attempts by a group of dedicated volunteers, the challenging and complex terrain has conspired to prevent the wreckage from ever being found. To put this into some perspective: according to Corporal Mark Nolan (Pilot, Australian Army), this is the only aircraft to have crashed on mainland Australia and never be recovered. We can only imagine how frustrating and heartbreaking this must be for the victim’s families to be denied this closure. One of the biggest factors that has inhibited previous search attempts is the rugged, dense bushland in the Barrington Tops national park. NSW Police Superintendent Peter Thurtell confirms that “the terrain out there is as rugged as anywhere you'll find in Australia.” Importantly, he notes that the primary search area has two steep ridges that makes it particularly difficult to get in and out each time, furthering hampering the efficiency of any search efforts. However, with recent advances in technology and some novel use of computational fluid dynamics using ANSYS ICEM and ANSYS CFD, we hope that this mystery is about to be cracked wide open. This coming weekend, the concerted efforts of numerous professional and volunteer organisations (including Police Rescue, National Parks and Wildlife, NSW Rural Fire Service, NSW State Emergency Service and the Bushwalkers Wilderness Rescue Squad) will combine to have over 100 members on the ground searching for the elusive wreckage of Cessna 210M VH-MDX. Police Superintendent Peter Thurtell adds that while the team is not overly confident, a lot of planning has been done and he now believes "we've identified an area that gives us the best chance of locating the plane." At this point, you may ask how CFD has contributed to solving this 32 year-old mystery? In advance of this major search operation in October 2013, the search coordinators recently undertook a major push to evaluate all the available evidence and comprehensively review all of the theories about what happened to the aircraft. The technology involved includes side-scan sonar of the Chichester Dam, high-resolution aerial photography as well as LIDAR scans of the likely crash site. After painstaking evaluation of the available evidence, the likely crash site was narrowed down significantly by a team of 5 people, including a Police Rescue intelligence officer, a Police GIS officer, a Navy Pilot, a 1981 Air traffic control operator and a dedicated volunteer, Glenn Horrocks, who just happens to be a specialist CFD engineer (in his ‘day job’). Details used by the team include air traffic control logs, the final radar location (just a few hundred feet above "The Corker" lookout, south of Carey's Peak), and the likelihood that it crashed within a few moments from this final radar fix. 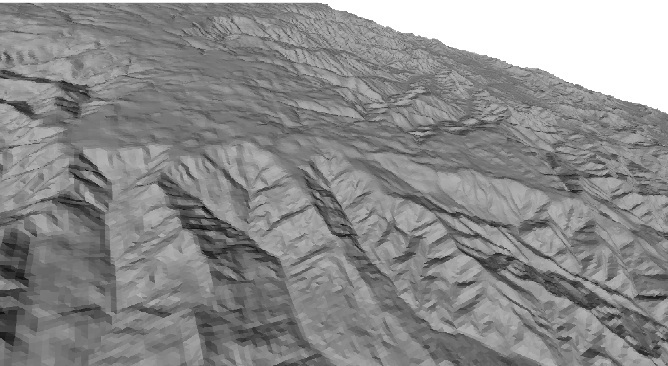 GIS Terrain data from Google Earth (100 km by 100 km at 100m resolution) combined with known weather data allowed Glenn to reconstruct the final few minutes of the aircraft's flight using CFD simulations, and assess the probabilities of various descent scenarios to narrow the most likely crash site to just a 1 km x 2 km area within the national park. The big question for CFD: Based on the complex local terrain at their last radar location (a very steep ridge with a strong wind blowing over it from the south-west), CFD simulations assessed whether the airflow would remain attached to the ridge (in which case the aircraft would have been caught in very strong downdraft and crash close to the top of the ridge), or if the airflow would separate from the ridge (meaning the aircraft would have continued for several 10s of seconds before finally crashing much further on the far side of the valley). In such unforgiving terrain, this difference in likely crash location may prove to be critical to the effectiveness of the search operations. 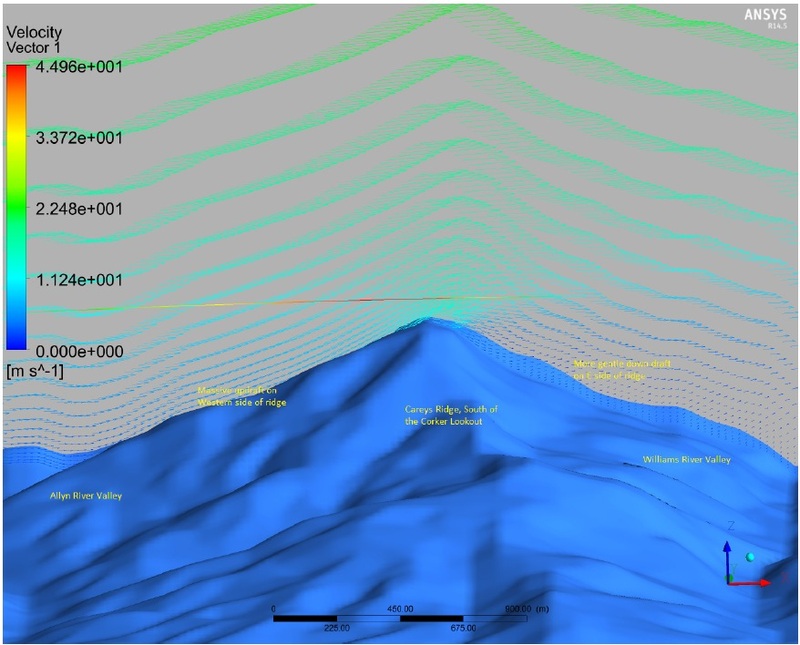 Glenn's CFD simulations found that, based on the known weather conditions, the flow would have separated over the ridge and the predicted wind sink speeds would have only been a small contributor to the final descent. 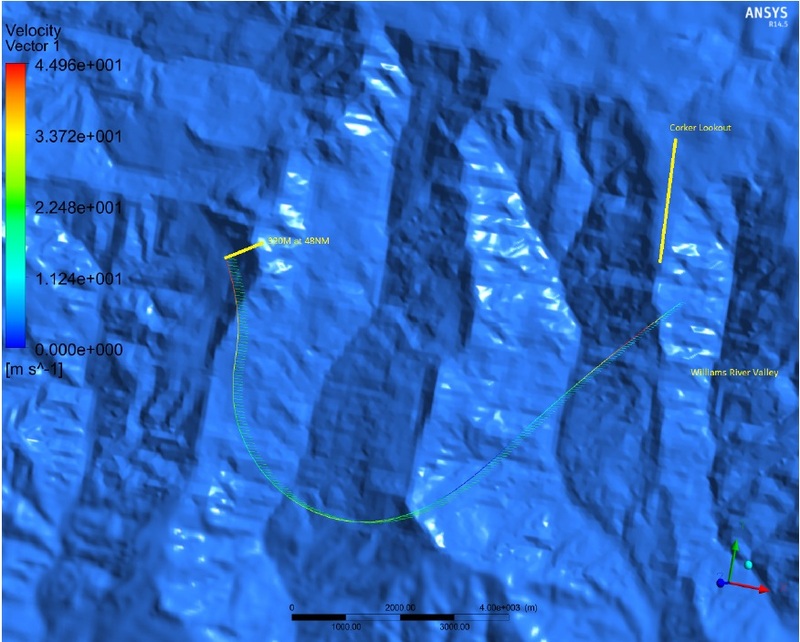 This data led the search team to conclude that the VH-MDX aircraft is likely to have made it to the middle or far side of the Upper Williams River valley, and identified a 2 square kilometer search region to be investigated with the highest priority. You can read more about Glenn’s work and his conclusions in the report posted to the BWRS website. At LEAP, we congratulate Glenn on his very effective use of CFD to help solve this real-world mystery, and applaud the selfless ongoing work of the many volunteers like him. We sincerely wish the best of luck to all involved in this weekend’s search: stay safe and good luck! All images courtesy Glenn Horrocks / BWRS. Great write up, thanks for that. I have just returned from the search. A bit battered and bruised (it is seriously rough country) and unfortunately no plane was found. But we have only searched 1/3 of the identified region, so we will be back there again next year and we will keep looking for it. I believe our analysis is still correct, we need to complete searching the area we identified because I am still convinced that is where it is. Thanks again for your support on this and one day the mystery will be solved. NSW Police Force Facebook page on the operation. Our video of the preparation and analysis of the search. This is a very interesting story. 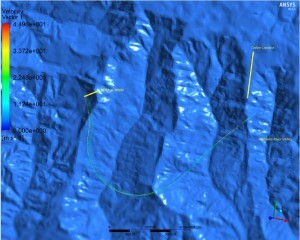 I know that using computational fluid dynamics is a big help in trying to locate the plane crash site. I hope that you are able to find it and Would like an update if possible. It is really wonderful to use the commercial CFD Codes to such a highly appreciative job and an unsolved mystery. I would like to do my part of help in the above being an avid CFD professional and interesting story to solve. Thanks BrandieBL and Srinivas for the comments. The Australian Newspaper is writing a extended piece about the story. I am not sure when it will be in print, I suspect it will be in next week's Weekend Australian (that is 30 Nov) but I am not sure. That report will show the search for this aircraft from a quite different perspective. Thanks for the offer of assisting Srinivas but the CFD work is complete now. The work to be done now is to search some of the toughest country in the state to actually find the aircraft. I was lucky enough to play a small part in this years search weekend. Absolutely in awe of the BWRS skills and commitment. Nothing is sure in an operation such as this but the best people are out there. I have a keen interest in the search for VH-MDX & after detailed searching of Google Earth maps & photos, I have found what appears to be the outline of an aircraft at the following Google Earth grid coordinates. It may only be a lens aberation from the camera which took the photograph, or a flare from sunlight hitting the lens (which I doubt as it appears the photo was taken in darkness). It may also only be my highly imaginative viewpoint, but in any case, it looks suspiciously like an aircraft outline to me, so it wouldn't hurt to check it out on the map at least. According to the Oct 18, 2013 LEAP CFD report it is possible that it lies within the broad search region, and is consistent with the strong SW winds blowing on the night. It appears to be at an elevation of 1252 metres, with an eye elevation of about 1.40 km giving the best resolution. Thanks for the location Greg! I will report this location to the Police for you. We have received over 20 sites from people reporting things on Google Earth and we are going through them over the coming months. In fact we went to Barrington Tops on 4 July to check out a few locations.